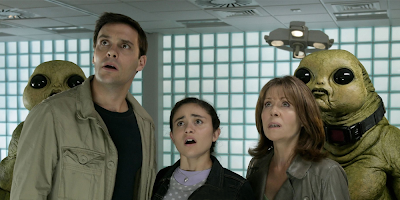 Synopses: Part one - Sarah Jane and the gang face some old alien enemies again, along with an altogether unexpected foe, in the final two-part adventure of the series.A news report on a couple looking for their missing son, Ashley, brings a surprise for Sarah Jane when she discovers that the missing boy looks exactly like Luke. 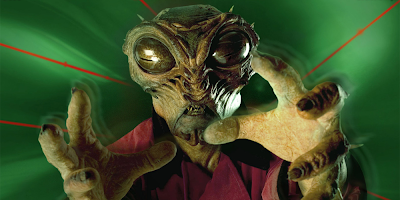 And when Mr Smith, Sarah Jane's super-computer, confirms that Luke is a genetic match with Ashley, Sarah Jane sends him back to live with his "parents". But, with no knowledge of his former life, Luke finds it hard to fit in and, when he tries to escape, he makes a startling discovery about who his parents really are. Sarah Jane, meanwhile, makes some investigations into the Pharos Para-Science Institute – a research unit that has been conducting experiments using alien technology. Part two - Maria and her dad, Alan, dig deeper into the mystery of Luke's new parents and discover that Luke has actually been kidnapped by the Slitheen, in the final episode of the popular children's adventure series.There are more shocks in store when Sarah Jane and Maria find out that Mr Smith, Sarah Jane's super computer, is one of the bad guys.With Clyde nowhere to be seen, Luke in the clutches of aliens and no Mr Smith to help, things aren't looking good for Sarah Jane and Maria. 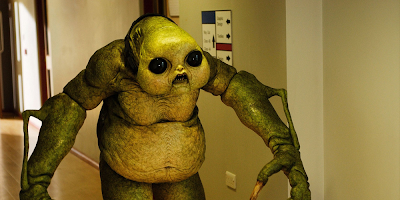 But just what do the Slitheen want with Luke and who, or what, exactly, is the Xylok? Episode Title: Whatever Happened to Sarah Jane? 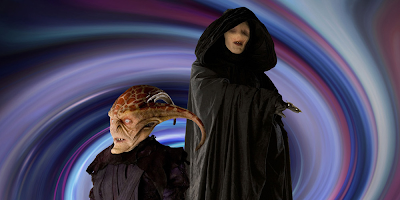 Synopses: Part one - In the fourth adventure of the drama series, Sarah Jane mysteriously disappears – just as a huge meteor threatens to crash straight into Earth. When Maria wakes up one morning it's as though Sarah Jane – and Luke – never existed. Living across the road in Sarah Jane's house is a woman called Andrea. And, with the attic empty and Mr Smith nowhere to be seen, every other trace of Sarah Jane has vanished – and Maria is the only one able to remember her. With the mysterious, hooded figure of the Trickster haunting Bannerman Road and the alien Graske meddling in time, Maria sets out to discover whatever happened to Sarah Jane. But as her journey takes her back to 1964, will she be able to find Sarah Jane in time to stop the meteor from destroying the world? Part two - Maria finds herself taken back in time by the alien Graske to a pier in 1964, as the drama series continues. There, she meets a young girl her own age called Sarah Jane Smith who, with her friend Andrea, is about to embark on a fateful adventure. Taken by the Graske again, Maria is then reunited with the present-day Sarah Jane but, with them both trapped in limbo as part of the meddlesome Trickster's plan to wreak chaos, they are helpless to stop the huge meteor which is about to crash into the Earth. Alan, Maria's dad, is the only one able to remember Sarah Jane and Maria and faces a struggle to bring them back in time to save the world. 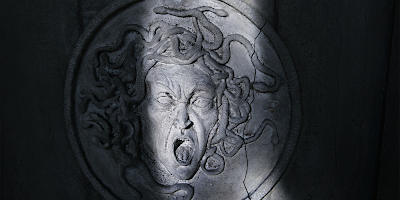 Part two - No synopsis was released for the second part of Warriors of Kudlak.